San Diego airport parking is closer to home and more affordable than you think! 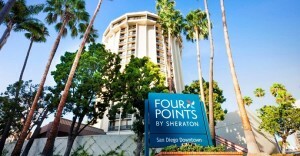 Four Points by Sheraton San Diego is less than a 10 minute trip from San Diego International Airport, yet closer to the heart of downtown than most San Diego parking options for the airport. What makes Four Points stand out from other options for airport parking in San Diego is the ability to leave your vehicle under covered parking, so it can remain protected from the elements in long term parking. 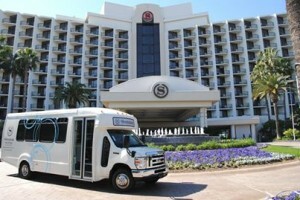 After parking your vehicle, catch a ride on Four Points’ complimentary airport shuttle, which runs seven days a week from 6:00 AM to 12:00 AM. Don’t care for the airline food (and who does, really?!)? The hotel is home to C3 Restaurant and Bar, which serves fresh modern American fare morning, noon and night to curb your hunger no matter when your flight is. Red Eye flyers rejoice! In order to receive this discounted rate, it is required that you book your reservation in advance… so pre-book your SAN Airport parking with snag a space today!